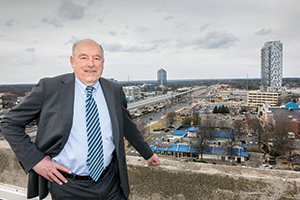 If Fairfax County developer C. Daniel Clemente has his way, more middle-class and hourly workers in the county’s fast-growing downtown Tysons area will one day have the option of walking to work instead of spending hours battling Beltway commuter traffic. “If you’re a secretary, you can’t [afford to] live at Tysons. If you’re a waiter, you can’t [afford to] live at Tysons,” says Clemente. He wants to build a 1,400-unit multifamily apartment building at Tysons, near the Spring Hill Metro Station, where all units would be affordably priced for workforce housing in exchange for the county waiving proffer fees of about $35 million on the development. Currently, Fairfax County requires that 20 percent of units in new multifamily housing be dedicated to affordable housing. Nonetheless, in a desirable area like Tysons — where rents can easily exceed $3,000 per month for a two-bedroom apartment — there are no incentives for developers to create much-needed affordable housing, Clemente says. If the county approves his unorthodox proposal, Clemente hopes the building, to be called Evolution, would be open to tenants within five years. As more and more millennials (and, to a lesser extent, baby boomers) move to downtown areas in search of walkable, cosmopolitan environments, corporations are following them in search of young educated workers. This phenomenon has created a scramble for affordable, workforce-priced housing in cities across America. In downtown Norfolk, where New Jersey-based Fortune 500 human-resources firm Automatic Data Processing (ADP) recently invested more than $32 million to locate an office with 1,800 employees, rents are prohibitive for some workers. With the average renter in Norfolk earning about $33,000 a year “not many of those people … can afford to live downtown where rents are very high,” says Ed Ware, director of communications for the Norfolk Redevelopment and Housing Authority. While developers are trying to meet the burgeoning demand for affordable rental housing, Ware says, it takes time to obtain permits, financing and tax credits. Downtown Richmond also is drawing more residents. “We’re seeing a lot of people moving back into the city, moving into parts of the city … where people haven’t lived since the mid-1900s,” says Lee Downey, director of Richmond’s Department of Economic and Community Development. In the popular Scott’s Addition area, not far from downtown, residential rents have more than tripled over the past decade to as much as $1,700 for a two-bedroom apartment. In the city’s recently released North of Broad/Downtown Redevelopment Project, it has included a “meaningful” mixed-income housing component as a requirement in a request for proposals from developers. The 20-acre project also calls for replacing the 47-year-old Richmond Coliseum as well as building a new convention center hotel and a bus-transfer plaza. “We want to make sure that our teachers and our firefighters, the working class, that they can have an opportunity to live in the city that they work in,” says Downey. The city wants to see a full slate of housing options in the project, ranging from subsidized, low-income apartments to workforce-priced homes for sale. City planners and developers have largely been unprepared for the influx of millennials. “People were a little bit asleep at the wheel in terms of demographics shifts … and the rate at which [millennial migration] has been increasing has caught people off guard,” says Daniel Parolek, principal of Opticos Design Inc., a Berkeley, Calif.-based architecture and urban design firm. A majority of millennials, who now outnumber baby boomers, want to live in walkable, urban environments, but developers aren’t building affordable housing fast enough to keep pace with demand, he adds. In 2010 Parolek coined the phrase “the missing middle.” It describes the type of workforce-priced housing that has been largely absent from cities for the past several decades. Such housing is particularly sought by older millennials who may be starting families and who may be forced to consider a move to the suburbs or to less-expensive cities if they can’t find available housing stock at an affordable price. American planning and zoning policies since the 1950s have been successful at enabling the development of single-family housing projects and high-density multifamily apartment buildings, Parolek says. Yet, they haven’t prioritized the construction of “missing middle” options such as duplexes, triplexes, courtyard apartments, town houses and live/work/play communities. Faced with increased demand for affordable housing, cities and developers now must meet this need with creative options, Parolek adds, including a mix of for-sale and rental properties in the same developments. Other options may include governments relaxing off-street parking requirements in recognition that millennials are less likely to own as many cars as previous generations. Additionally, developers may consider “communal” housing designs aimed at millennial roommates. These arrangements would offer individual bedrooms and bathrooms but shared common areas. Another problem contributing to the lack of available workforce-priced housing is that some senior citizens aren’t selling their homes, says Richmond Association of Realtors CEO Laura Lafayette. That’s because what could be a next option for them isn’t affordable. According to a recent study commissioned by Lafayette’s association, about 70 percent of seniors in the Richmond area owning homes valued at less than $200,000 aren’t moving because the age-restricted housing communities in the area start at more than $300,000. That’s keeping an estimated 9,000 starter homes off the local market. When these homes do go on sale, Lafayette says, they’re often under contract within a day because demand is so high. Without available affordable rental or sale options, “millennials will pick up and move” to another market, she adds, creating a problem for corporations that want to retain talent. Millennials “are much more courageous than their parents in that regard. One unexpected side effect of the downtown migration is that, with millennials and baby boomers vacuuming up available affordable housing, people who make less than the area median income are left with even fewer options in cities. With millennials and baby boomers moving back in, “our cities have gotten safer and more vibrant, and that’s all great news, but the bad news is our lower-wage workers are not finding housing there as easily anymore,” says Nina Janopaul. 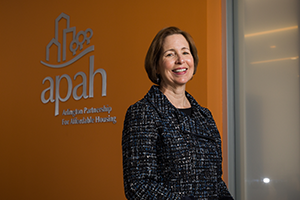 She’s the CEO of the nonprofit Arlington Partnership for Affordable Housing, which helps provide apartments to low-income families in Northern Virginia. In recent local studies, Arlington County and Alexandria determined that more than 85 percent of their areas’ naturally occurring affordable housing stock has disappeared during the past 15 years. Investors have bought up older and distressed properties and remodeled them to appeal to millennials with amenities such as fitness centers and granite countertops, Janopaul says. “New developments are always going to be geared toward the highest payers, and the folks that are often the most desirable demographics. 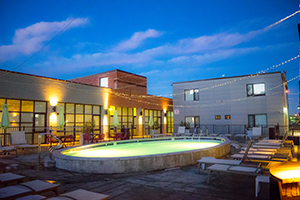 And millennials usually tick that box because they can pay higher rents and want to live downtown,” says Washington, D.C.-based developer Jeff Wainwright of West End Capital Group, which has redeveloped aging apartment complexes in Richmond and Hampton Roads. However, with rents rising, “people are getting priced out of downtown. Not everybody can afford it,” he says. Affordable housing advocates are relieved that the country’s recently passed tax reform bill retained tax credits for low income housing. However, there is concern that the the reduced corporate tax rate, from 35 to 21 percent, could decrease the value of the housing credit for investors. With a recent study showing that seven affordable housing units are needed for every unit built, it’s an issue that’s not going away, notes Robert Sheppard, managing director of CBRE’s Affordable Housing Group. “Cities are proactively and aggressively trying to come up with solutions to this problem,” he says.